The concealed sliding doors take advantage of the interior part of the walls to save space in comparison to the hinged doors and allow you to separate two areas for privacy reasons or to unify them without noticing the doors, since they are hidden inside the walls. They are also defined interior wall doors and have numerous advantages. Let’s find out them! First of all, they allow you to save space, since they keep the wall free and you won’t find any obstacle during the opening. Secondly, they are characterised by a modern design that seduces and represents a great added value to the appearance of the environment in which they are set. They are conceived for giving a concrete answer to the needs of the contemporary living and to the new styles of design. The concealed sliding doors have a minimalist and elegant image and allow you to save space using the thickness of the walls. It is estimated that inside a 100 square meters flat there are only 8 square meters available as extra space; you just have to think at the blind corners that are created from the classical hinged doors that are never used. With this different type of door, the blind corner does not exist, and that surface is entirely earned, ready to be used in the most appropriate way. The sliding internal walls doors separate two rooms or, if necessary, unite them with the utmost discretion, offering various combinations thanks to the 1 or 2-way tracks. Combining modernity and technique, these doors disappear thanks to their structure and do not create obstruction when they are opened. 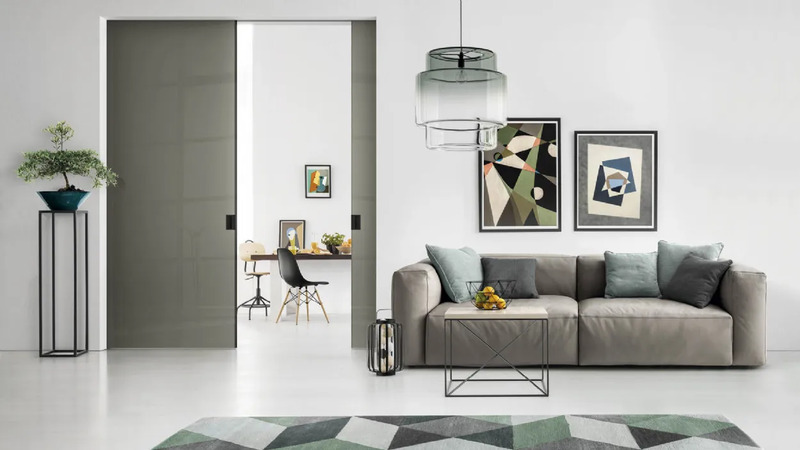 The concealed sliding doors require a wall intervention because they need to be inserted inside the wall with a subframe, that is a special metallic case with apposite sliding cart. The subframes are available both in the version for the plaster and the drywall. Moreover, there are subframe models that are set for the passage of the cables that allow you to have switches, dimmers and sockets nearby. Who buys a subframe equipped with removable track has the opportunity to intervene on the sliding area to remove dust or residue of mortar without having to throw down the wall. The main producing companies provide a guarantee on the principal components of the product. Generally, a subframe is designed to last an entire life thanks to its peculiar use. The unique elements that are subject to usury are the carts, but they can be easily substituted just removing the door. The doors of the concealed doors are made of wood, glass or glass with aluminium frame. The glass is always very popular since it enlightens the environment. It is ideal mostly for the small environments. The suggestion made by Doal can be applied to the different subframes available on the market. The traditional concealed doors are endowed of aluminium jambs that work as frame for the passage compartment. There is the opportunity to choose a matching cornice to the frame of the door in different colours: silver, inox, white and brown. For what concerns the glass doors, Doal also realises different decorations applicable to the surfaces. This is a way to give the door great temper and to personalise more your house. They give lots of light in your house and they can also be personalised with the company’s logo, decorations and drawings, plays of chromatic contrasts, materic contaminations, combination of different finishes: there is great freedom of creativity that is translated into a unique piece of furniture.